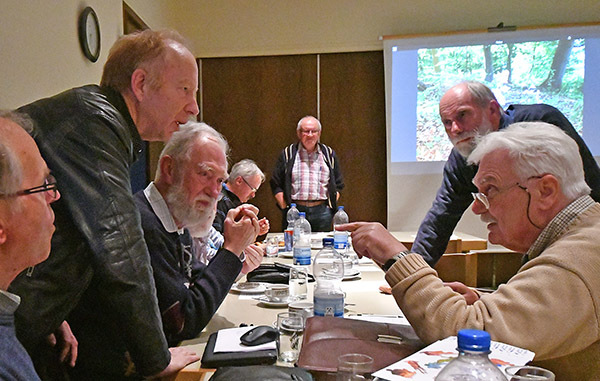 After 21 years, the Orchid Conference of Sundheim, Germany, has found a new place: About 50 participants met in Kehl-Neumuehl in the beginning of October, in a Protestant community centre, only a few kilometres away from the traditional meeting place in the old “Stierstall”. The history of the conference has been described by Werner Hahn in the latest edition of Berichte aus den Arbeitskreisen Heimische Orchideen (Jg. 34, Heft 1, 2017, S.234-237). This year, the program focused on travelling reports from Iran (Jean-Marc Haas), Croatia/Greece (Stefan Hertel) and Israel (Helmut Presser). Jean-Marc showed findings of Ophrys zagrica in an altitude of 2300 metres, Ophrys khuzestanica and Ophrys strausii as well as Tulipa stapfys in the midst of dry pebble, Fritillaria imperialis or Iris acutiloba subsp. longipetalis. Stefan followed the transition of Ophrys incubacea to Ophrys mammosa and presented Ophrys cephalonica from the island Kephalonica with its long narrow sepals. In the beginning of March, Helmut has explored Mount Karmel and Mount Meron. Among the species which grow there are Ophrys carmelii and Orchis galilaea. Typical for the delight of orchid scientists in disputes was a discussion after a lecture of Wolfgang Wucherpfennig. He stressed his criticism on the taxon Ophrys lutea var. subfusca for an orchid flowering in Northern Africa. The description of Heinrich Gustav Reichenbach in 1851 – along with two not so significant sketches – had resulted in the fact, “that the name subfusca has been used for many different species in the following years”. The situation which has been developed is quite disturbing. 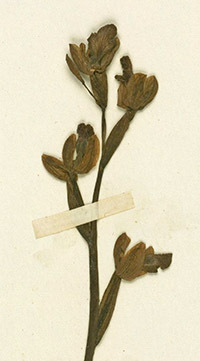 Wucherpfennig pleaded anew: “The name subfusca should not be used anymore but should be viewed as a nomen dubium.” But Karel Kreutz pointed out that a herbar finding in the Reichenbach collection which is indicated as “Ophrys fusca” should be viewed as the holotype of Ophrys lutea var. subfusca. And he stated that he has found according plants in Algeria – documented in his paper C.A.J. Kreutz/L.Lewis: Typification of Ophrys lutea var. subfusca Rchb. f., invalidity of the name Ophrys murbeckii H.Fleischmann. In: Journal Europäischer Orchideen Vol. 46, 1/2014. The participants persued their discussion for a while – without answering the question why this detail of science history should be so relevant. In the long term, questions of the preservation of orchid species are much more important than any taxonomic debates.